What's Up? with Sense8 season 2? It’s been about two months since io9 has mentioned Sense8 and some stuff has been happening both in front of and behind the cameras for that show, so let me just round up some news packets. 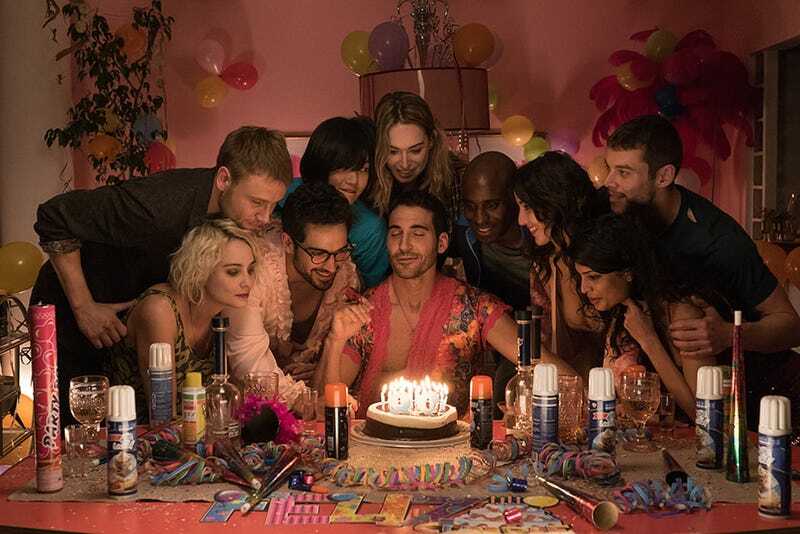 1) Sense8 won (and lost) some awards. It got a GLAAD Media Award for Outstanding Drama Series but! it did not win in either of the two categories (LGBTQ TV show of the year, Campy TV show of the year) it got nominated in for the Dorian Awards. It got nominated for a Best New Media Television Series award at the Saturn Awards so when those awards get handed out in late June we’ll see what happens. 2) Oh, and at the GLAAD Media Award ceremony Lilly Wachowski gave her first public statement in re: being trans. It wasn’t exactly what she had planned about talking about but when the Daily Mail sort of threatens to publish without your consent your hand gets forced. I mean not that ... any ... websites around here do that kind of outing of people. That would just be rude. 3) A member of the cast left. Capheus’s actor, Aml Ameen, apparently had creative differences with Lana Wachowski and so Capheus has a new actor, Toby Onwumere. 4) And then a showrunner left. Lilly needed to take some time off, so, the show’s second season will be the first solo effort from a Wachowski in a while. And that’s where things are for right now. The show is still filming so if you want to follow along, I’d suggest following #Road2Sense8 on Twitter or Sense8 on Instagram or Sense8 on Tumblr. edit on December 1 2016: io9 reports that an episode will drop on the 23rd of December.